If you had a chance to travel on Highway in North India, then these dhabas are inescapable. Dhaba is nothing but roadside eatery where you can enjoy hot, spicy food at nominal rates. Dhaba dal along with tandoori roti is a must try for anyone eating in roadside dhaba. Dhaba dal is a combination of 3 dals or lentils. 1. Wash urad dal, chana dal and rajma. Drain and soak in enough water overnight or at least 6 hours. 2. Drain dals and pressure cook with enough water and salt for about 1/2 an hour or till tender. 3. Heat oil and butter together in a pan. Add garlic and sauté till light brown. 4. Add onion and green chillies and sauté till onion turn light brown. 5. Add red chilli powder and cumin powder and fry for 1 minute. 6. Add tomatoes and sauté till tomatoes turn soft and mushy. 7. Add dal and mix well. Add kasoori methi and coriander leaves. Cook on low heat for 10 minutes, stirring occasionally. 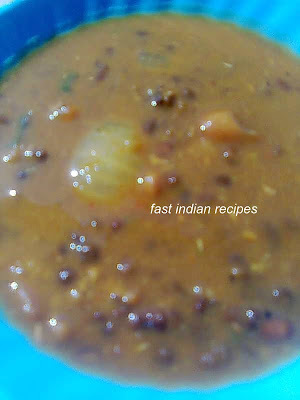 Serve hot dhaba dal with roti or rice.